What is the value of information over time? It has been a few years since A Kickstarter’s Guide to Kickstarter was published and the crowd-funding world has changed a lot since then. There are more crowd-funding sites, more crowd-funders, and more write ups about the process. As a result I’ve begun to wonder what is the value of my guide over time? As information gets older does it become less valuable or, dare I say it, worthless? Continue reading What is the value of information over time? Posted on November 6, 2014 December 3, 2014 Categories NewsLeave a comment on What is the value of information over time? A couple months ago I wrote that I am moving on from Kickstarter Guide, but still wanted to find a way to share my crowd-funding insights. Well over at Medium.com I started a series called Inside The Campaign. I will be posting weekly updates as I working on a campaign for my upcoming documentary film Identifying Nelson/Buscando a Roberto. The goal of this series is to give you a look into my thought and decision making process. This is not going to be a “course” or a “how-to series.” I won’t be giving general advice about how to structure a campaign. Instead, I will talk in detail about our campaign, so that you can learn from my insights and mistakes. So I hope you will check it out and let me know what you think. Best of luck with your own campaigns, and as always drop me a line and let me know what you’ve built. A few weeks ago I was contacted by someone from the Kickstarter.com legal department. We’re thrilled to see that you had a great experience as a creator on Kickstarter and are looking to help others with your experience. However, your site as it’s currently designed is likely to confuse people into thinking that it is an official guide or is endorsed by or affiliated with us. Please remove all uses of our logo from your site and your guides, and include a disclaimer stating that the site is in no way affiliated with or endorsed by Kickstarter. Thanks, and please let us know if you have any questions. I always wondered if I would get this email. From the very start of the project I worried that someone at Kickstarter might take issue with it. I was calling the book “A Kickstarter’s Guide to Kickstarter” and in the design process I chose to include the Kickstarter logo on the front cover. I wasn’t quite sure if this was “allowed” but it just made sense to me artistically. I mean, what better way to represent the site than with its own image? Despite my concerns I decided to go forward. So I was thrilled when I got a chance to share it with someone who worked for Kickstarter. In the process of writing the book I tried to interview one of the Kickstarter founders. I knew it was a long shot but I wanted to make the best book possible and an interview with Perry or Yancey would help with that goal. I got a really nice email back from someone on the PR team who explained that the founders where very busy but he would be happy to look over the book when it was finished. I sent him a copy as requested and to my surprise not only did he like it but he sent a list of connections! He did not mention the logo at all, which eased my concerns. Honestly, I was pretty excited to get the buy in of someone from Kickstarter. I had put a lot of work into the guide to make it the absolute best it could be and their approval was important to me. The last thing I wanted was for them to think I was trying to trick or manipulate people into buying the book. So that is why I was pretty disappointed to receive the email from Kickstarter Legal. I decided to write them back and state my case. I felt the email they sent me was a little vague. They had done some research into my project but it didn’t seem like they had taken the time to really understand it. You can read my full response here but I will summarize my three main points. 1) Why has the use of the logo only now become a problem? I pointed out that the book has been out for almost 2 years. I explained how I had shared it with someone on the PR team in development. I pointed out that one of my backers worked at Kickstarter and another employee who I met at an event thought it was very well done. None of them had an issue with the logo, so why was it a problem now? As said before, I have always been weary of people getting the wrong impression of the book. So over the past two years I’ve taken steps to try and make it clear that the book is based on my experiences and not a product of Kickstarter.com. For example, I’ve always had a disclaimer on my site. I do not feel like I have acted in a way that would confused people but I wanted to understand how they arrived at this conclusion. 3) Does using the logo on the blog constitute as fair use? I’m not a lawyer, but my understanding is that one can use a company logo as part of a blog post to identify the company, as long as it does not imply endorsement. Using the logo in this way should fall under fair use.It only appears on one post but I wanted to make sure that my assumption was true. I hoped that by writing back and explaining my side of the story they might reconsider or at the very least give a more detailed explanation. I pressed send on my email and a week later I got this response. Thanks for taking the time to respond. In order to protect the integrity of the Kickstarter name and brand, we’ll need you to remove the logo from your site as requested and to include a prominent disclaimer of affiliation on the home page of your site. I was disappointed to say the least. Not only did they not reconsider, but they didn’t even take the time answer any of my questions. Honestly, it’s not their decision that frustrated me. It’s the fact that they didn’t even acknowledge my points or answer my questions. I totally understand that it is up to Kickstarter how to enforce the use of their logo; I don’t disagree with this at all. It is really the lack of a response, and their anonymous signature, that makes me feel brushed aside. The kicker is I’m probably doing more for their brand then their brand is doing for me. A lot of people come here to find out how to learn about Kickstarter and then go on to run a project. Most of those people do not end up buying the book. I did the calculation and less than 1% of all visitors show any interest in actually buying the guide. That is fine by me. To me, what is more important than making money is that I hope the book is helping people. I felt that their email suggests that somehow my book is taking away from their brand in a negative or misleading way. This experience has been interesting because I just finished a book written by the founders of the home cleaning company Method called The Method Method. Once of their core principles is to inspire their customers and fans. They talk about one of their biggest online advocates, Nathan Aaron, who runs the site Methodlust.com. Having recognized the value of such a voice, Method has nurtured Nathan’s lust by responding to requests for interviews, sending updates on Method products, and supplying Nathan with pictures and other content… As a fan of the brand, Nathan’s blog methodlust.com helps spread our mission and keeps us honest. The complaining customer doesn’t want a refund. He wants a connection, an apology and some understanding. He wants to know why you made him feel stupid or ripped off or disrespected, and why it’s not going to happen again. I’ve been a big fan of Kickstarter from the very beginning. I’ve told everyone I know about it. I’ve helped several people structure their projects. Hell, I even wrote a book about it. I’ve had a great experience so far and almost everyone I have interacted with has been great, but this just rubbed me the wrong way. It’s just disheartening to me to not have even been given the time of day. Perhaps the days of being a small start up are over. Will I still use a service? Sure, but I really hope this is not an indication of what’s to come. So, reluctantly, I’ve created this new book cover. My interaction with Kickstarter Legal reignited an integral debate that I have been having since the start of the year about what to do with this project and website. Over the years, while doing entrepreneurial projects, I’ve learned the importance of focus. To make any meaningful traction you can only really work on a couple projects at a time. Any more than two and all your projects start to suffer. One thing that people tend to do is hold onto projects for way too long. We develop an emotional attachment to our project because of all the work we put in. We hesitate to let go or move on because we are fearful of missing out. What if this project takes off? I’ve benefited greatly by letting go of old projects. It frees up mental bandwidth and allows me to move on to something new. All my old projects were great, and I am proud of them but it was time to move on. That is the way I feel about my work on the Kickstarter Guide. I also feel like I need to more time to finish my documentary film. My original vision for the project was to write a book about my experiences and help people who are just starting out. I wanted to practice shipping an idea and get used to putting myself out there. I feel like I have accomplished this and more. The guide has been downloaded over 600 times and helped several people (that I know of) to launch projects of their own. The site has been visited by more than 13,000 people in the last year alone. (I know that’s not a lot for bigger sites but it is the most impact I have ever had.) I’ve received a lot of compliments about the guide and it has led to new opportunities for me. As a project that was just done to practice shipping, it has been more successful than I could have imagined. But I feel like it’s time to move on. My biggest problem is that I am someone who needs a vision, something to work toward. Now that the guide has been published I’m not sure where to go from here. There are a lot of things I could do, like a second edition, an online course, or just continue posting here infrequently. But none of these scenarios appealed to me. I never felt like the project got enough traction to merit the creation of a second edition or a course and as I said before I like the idea of letting go. So after my experience with Kickstarter legal and much deliberation with friends and family I have decided to move on. It was not an easy decision. Part of me still feels like I could make a big impact with my writing but I think this project has served it’s purpose. I might do something with the rest of my ideas and insights but it would be in the form of a different project. I am going to leave the site up and running as is. The guide will still be available for download and I will continue to receive emails at dewittn@kickstarterguide.com. However, I will no longer be updating the blog. I will also delete all the social media accounts for the guide except YouTube which hosts all the interviews. Thank you for reading and thank you for all the wonderful feedback. I wrote the guide to help people and I’m so glad people are finding it a useful resource. I’m going to end this blog the same way I ended my guide. You may think your project isn’t that important, but you never know who you will inspire. Many of the people I talked with, said how the success of other projects got them to launch their own. So go out there and make something happen. A Kickstarter’s Guide has Launched! 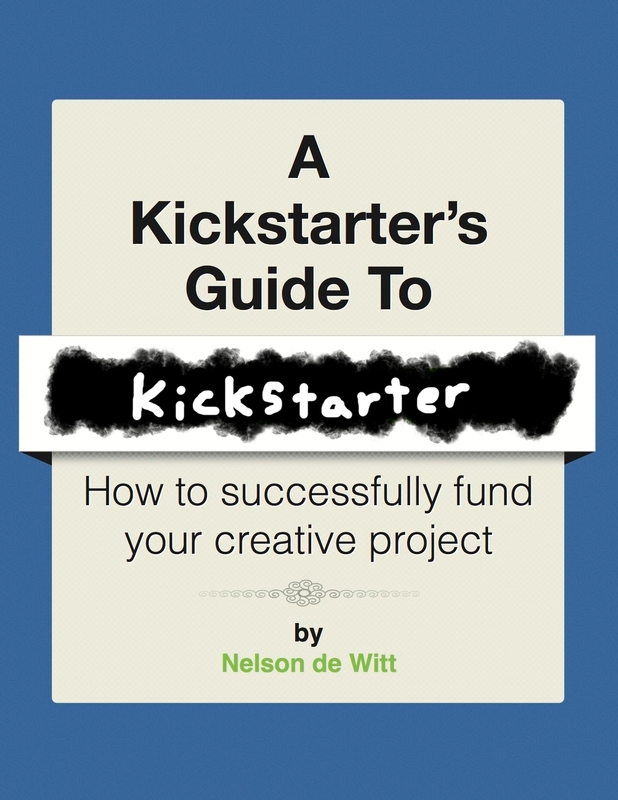 A Kickstarter’s Guide to Kickstarter is out. Head over to the download section to grab a copy. I’m still getting things set up but check back soon for more Kickstarter related news and updates. Posted on October 24, 2011 June 7, 2012 Categories NewsTags Guide, Kickstarter2 Comments on A Kickstarter’s Guide has Launched!